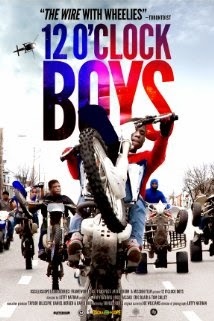 Movie Review: ‘12 O’clock Boys’ is the name of an illegal group of urban dirt-bike riders from Baltimore that inspired this documentary directed by New York based filmmaker and visual artist, Lotfy Nathan. The ‘boys’ challenge the local police by riding at high speed in streets packed with traffic and showing off through bike stunts. These provocative behaviors reveal to have two reverse sides for a powerless police that adopted a no-chasing policy in order to guarantee public safety. For the majority of Baltimore’s inhabitants they are seen as a radical group, while for others, such as the young Pug who is trying to join them at any cost, they are heroes and models to follow in the near future. Pug’s mother, Coco, is the one not to be satisfied with her son’s obsession, but will she be able to make him see differently? This family interaction along with decent shots of the dangerous neighborhood, were the aspects that held up the levels of consistency, since the streets’ stunts soon started to be repetitive and finally a bit boring. Even with the slight sensation that the film could have been better developed, “12 O’clock boys” is at the minimum curious and thought provoking, having a voice that speaks for itself. I felt confronted by these aimless men who don’t seem to care about the consequences of their acts, but only their exhibitionism and ego. Is the documentary sufficiently explanatory? Yes. Educative? No. Fascinating? Reasonably.